I’ve been doing loads of fun cooking recently but almost all of it has been testing – 3 books! More on that to come very soon, but for now here’s the one dish I’ve made for ages that hasn’t been a test for someone. I got in from football last night at about 7:20 and wanted something I could have on the table very quickly. This dish, from Veganomicon, fitted the bill perfectly. I’d been putting off making this dish because I couldn’t find vegan spinach pasta anywhere. I know I could have done it with plain linguini but I knew that eventually I’d find some spinach pasta somewhere and was happy to wait. I eventually found it in the strangest place – the local chinese supermarket. Even though they’ve got a whole aisle full of noodles I was still quite shocked to see spinach noodles there. it just show that you can find unusual ingredients anywhere if you keep your eyes open! 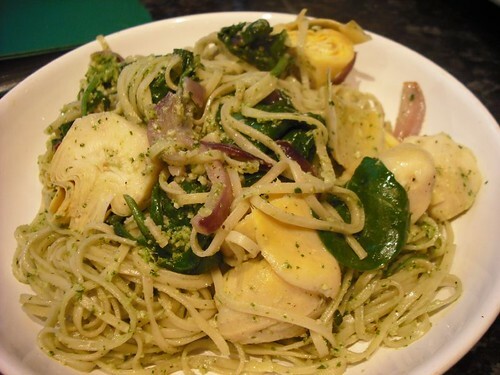 The pesto was easy and tasty and once you’ve made that the dish couldn’t be simpler – it’s just red onion, garlic and a splash of wine. I threw in some spinach as well as my day so far had been notably lacking in vitamins and heavy on alcohol. My one complaint is the use of tinned artichokes. I generally prefer jarred, but the recipe specifically says not to use them and to use tinned. Maybe not all tinned artichokes are created equal, because mine (Sainsburys) were very metallic and jarred with the lovely silkiness of the rest of the dish. I will certainly make the pesto again, it was a lovely bright green and nice and zingy. This looks splendid. I would always go with my instinct and go with jarred artichokes. Waitrose Cook’s Ingredients are fab and I think far better than Sainsbury’s. They do a marinated aubergine that would be wonderful here too.